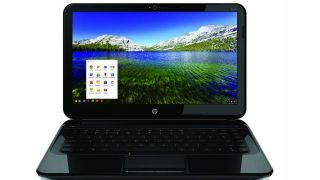 Google and HP are Chromebook fellows now, as the latter introduced its first laptop running the OS Monday. Dubbed the Pavilion 14, the 'top, in HP's estimation, is about 2 inches wider (diagonally) than any other Chromebook available, giving it a screen size of (you guessed it) 14 inches. HP is billing it as the "world's first full-sized Chromebook." For the sake of stacking its screen up to those on other Chromebooks, the Acer C7 has an 11.6-inch display, also found on the Samsung Series 3 and Lenovo ThinkPad X131e. The Series 5, another by Samsung, wrangles a 12.1-inch screen. The 3.96-pound Pavilion is U.S.-bound, available now through hpdirect.com and starting at $329.99. Included in the price is 100GB of free storage on Google Drive for 2 years. We first spotted the Pavilion in a leaked spec sheet last week, a document that turned out to be just about spot on. HP squeezed an Intel Celeron 847 1.1GHz processor and HD graphics into the Pavilion, plus 16GB of storage via a solid state drive. Described as "sparkling black" on the outside, the Chromebook comes with the standard ports - an HDMI, three USB 2.0 and an Ethernet jack, plus a combo headphone and microphone jack. The removable battery can last up to 4 hours and 15 minutes, while memory sits at 2GB DDR3 but is upgradeable to 4GB DDR3. What's the resolution like on that bigger screen? 1366 x 768, according to the machine's spec sheet, the same as the Series 3. We're not sure if bigger is really better, but we're glad to see the Chromebook garden starting to welcome more varietals.